"Hubble diagram" for host galaxies of BL Lac objects, showing apparent magnitude versus redshift (Sbarufatti et al, 2005). The diagram can be used to estimate unknown redshifts if the brightness of the host galaxy is known. In case of the object PG 1553+113 discussed this month, the host galaxy cannot be detected and the upper limit on its brightness - only the yellow region is allowed - would place it at a rather large redshift. The object PG 1553+113 was discovered in the Palomar-Green survey of stellar objects with excessive UV emission (Green et al. 1986). Since its spectrum does not exhibit prominent emission or absorption lines (Miller and Green, 1983, Falomo and Treves 1990) and since its brightness is variable, it was classified as a BL Lac object (Giommi et al. 1995), i.e. as an active galactic nucleus where most of the emission is attributed to a matter jet emerging from the central black hole, and pointed towards the observer. This classification is confirmed by X-ray emission (Perlman et al. 2005,Donato et al. 2005). A subject of long discussion, however, was the redshift of PG 1553+113, i.e. its distance. Initially, a redshift of z=0.36 was attributed by Miller and Green (1983) on the basis of a faint emission line. Falomo and Treves (1990) pointed out that this "line" was a spurious flaw in the image, that was misidentified as the Lyman-alpha line. Even in images taken with 8 m class telescopes, no genuine lines were found. Also, no host galaxy could be resolved in images taken with the Hubble Space Telescope (Scarpa et al. 2000). 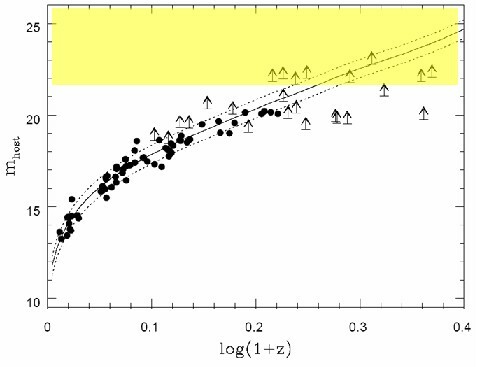 For most "nearby" BL Lac objects, a host galaxy is detected (see top figure), and a lower limit on the redshift of z>0.78 was given by Sbarufatti et al, (2005) , making this a rather distant object. On the basis of its flux in the X-ray and radio domains, PG 1553+113 was selected as an observation target for H.E.S.S. (seeNov. 2005, Fig. 1). This happened before the redshift limit z>0.78 was published; due to absorption of gamma rays in interactions with the infrared and optical radiation in the space between galaxies (see Dec. 2005), an object at such a distance should not be detectable. Surprisingly, a hint for very-high-energy gamma ray emission was found in the H.E.S.S. data (Fig. 1), initially with a significance of about 4 standard deviations, increasing with more than 5 standard deviation when the selection criteria were optimized for steep-spectrum sources. Since high-energy gamma rays are more strongly absorbed, surviving gamma rays for very distant sources are expected to show a flux which rapidly decreases towards high energy. Indeed, the measured spectrum (Fig. 2), with a spectral index around 4, is among the steepest spectra ever measured in the TeV regime. Based on the detection of two other active galaxies,1 ES 1101-232 and H 2356-309, the H.E.S.S. collaboration showed that there is less radiation in the space between galaxies than previously assumed (see Dec. 2005). The detection of PG 1553+113 - if indeed at a large redshift - dramatically supports this result. With radiation levels at the upper limit allowed from the earlier H.E.S.S. data, the redshift for a source with such a spectrum cannot exceed ~0.45 (Fig. 3), in conflict with the lower limit derived from the Hubble images. 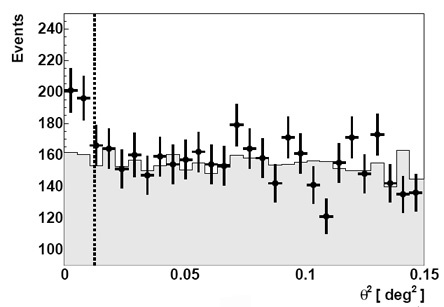 Only with radiation levels near the very minimum possible value, counting only light from known galaxies, a redshift up to ~0.65 to 0.75 is tolerable, marginally consistent with the Hubble limit of Sbarufatti et al, (2005). We note, however, that a recent analysis also based on the lack of detection of the host galaxy gives a more conservative lower redshift limit of z>0.09 (Sbarufatti et al., 2006). Obviously, efforts should be made to reliably establish the redshift of this interesting object! Fig. 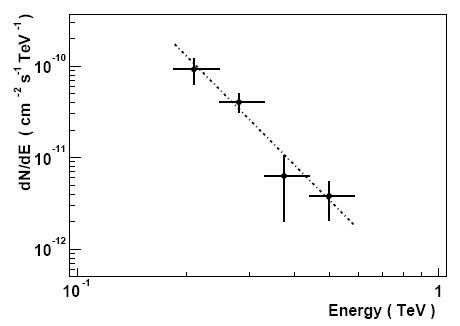 1: Angular distribution of reconstructed gamma-ray directions relative to PG 1553+113. The shaded area shows the estimated background; the excess of 83 gamma rays at small angles corresponds to a statistical significance of 4 standard deviations. Fig. 3: Absorption in intergalactic space makes gamma ray spectra steeper. The graph shows the spectral index for the source ("intrinsic photon index" Gamma, defined via dN/dE ~ E-Gamma), required to match the observed spectrum once absorption is taken into account, as a function of the distance (i.e. redshift) of the source. 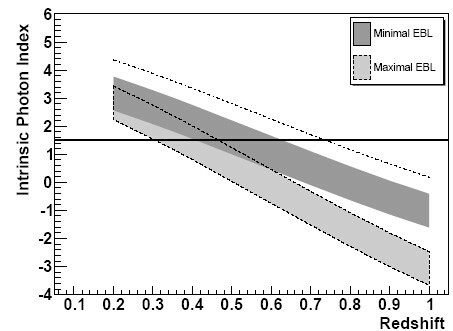 Plotted are two scenarios for the density of radiation in interstellar space, "maximal" represents the upper limit derived using earlier H.E.S.S. results, whereas "minimal" includes only light levels based on galaxy counts. Plausible models for gamma ray production result in an intrinsic index which is 1.5 or larger. An upper limit for the redshift can therefore be derived as the point where the shaded bands fall below a value of 1.5.